I shoveled today. Not the best intro for a Spring collection, but it's true. Someone, somewhere, is severely confused- isn't the snow supposed to be melting, not accumulating? Ugh. Anyhow, let's continue on with the Spring inspired shades in the Hello, Sunshine! Collection from Mary Kay. Today we'll take a peek at the eye products in the form of Springy Eye Duos and Gel Liner. Read on! When I first read Springy Eye Duos I assumed it was a nod to the season- you know, Spring- but it's actually a texture description. You see, these cute little shadow duos have a bouncy, springy texture (like those Maybelline blushes that came out a while ago.) The shadow itself is a hybrid type product that combines cream and powder shadow. 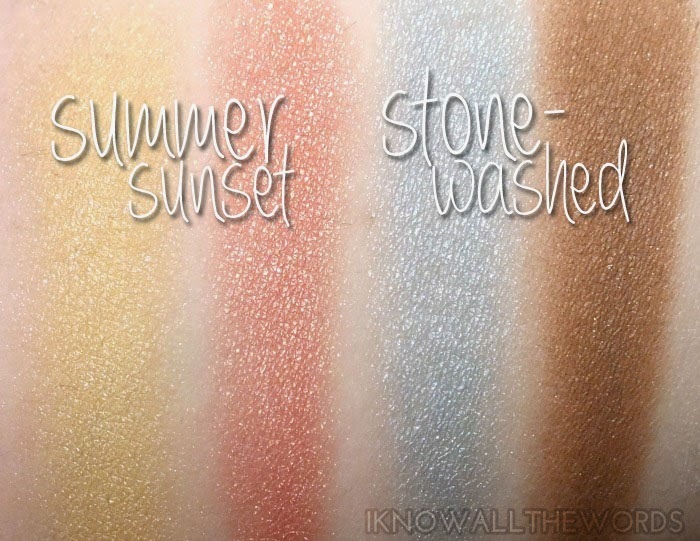 The small pots hold two corresponding shades- Summer Sunset has a pale yellow and coral shimmer while Stonewashed has a light blue shimmer and an almost matte milk chocolate brown. These are quite pigmented when swatched with your finger, but it doesn't translate as well on the eye. Due to the texture and sheerer finish, these work better as a wash of colour or used as a base for other shadow. I did find that these wear pretty decently over a primer- I found they creased fairly quickly without one- but do fade after a few hours. For the look above, I kept it simple and used the coral shade from Summer Sunset across my lids. I used the yellow shade to blend the edge, for a sunset type look and lined my eyes with the brown shade from Stonewashed. I didn't quite know what to think about a white gel liner, but was impressed with the overall quality of White Daisy. The formula is smooth and quite opaque. It applies quite well with an angled brush- the little brush included with this works fine, but I found I could get a cleaner line with less effort if I pressed the liner on with an angled brush as opposed to gliding it on. When you glide or drag it on it can be patchy, which isn't so great. I can't see myself using this much as a liner, although it could make for some very interesting graphic looks, especially if used in combination with a black liner, but this does make a fantastic base for shadows. It sets completely and only takes a moment to do so, and works nicely under bright or pale shadows (think Spring pastels!) and gives them both longer wear time and more pop. Overall, some cute items. 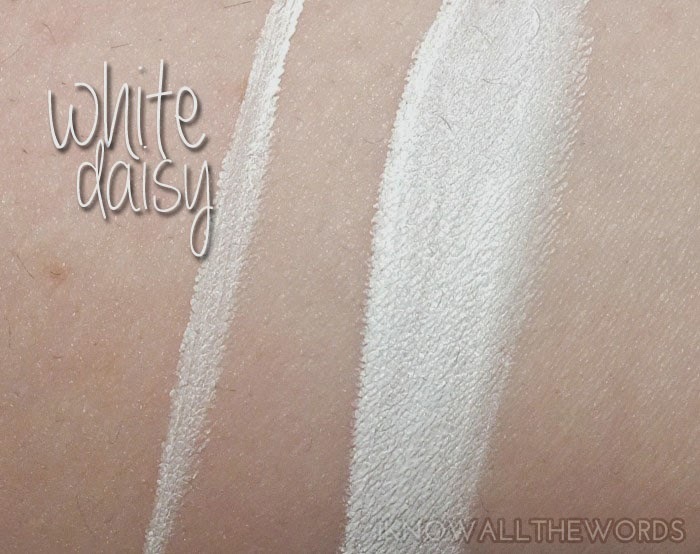 I wouldn't call them must haves, but White Daisy is something super handy to have on hand as a base. What do you think of white liner? How do you use it?